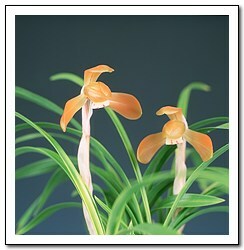 The American Orchid Society (AOS) has published information on the cultivation of Miniture Cymbidium orchids. We would like to add to these general growing conditions some specifics that may be applied to Asian Cymbidiums in particular. Some of this information has been gathered from many years of growing experience, and we hope to share it in order for us all to enjoy stronger and healthier plants. We have devoted a lot of space on this website to the Asian(Korea, China, Japan, Tiwan) Orchid Vase. If you take the time to read and understand all of the notes given here you will understand why we highly recommend growing in the Asian Orchid Vase. 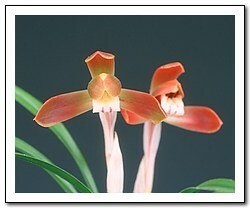 Healthy Asian Cymbidiums have very long and powerful roots. Potting in deep containers encourages root growth and helps result in a healthy plant. Deep wide containers result in new growths, but few and weak blooms. Slim deep containers, encourage strong tall spikes, with vigorous blooms. It is not a coincidence that in every Asian orchid growing culture the vase has very similar dimensions; the Asian orchid vase has evolved over time to be in perfect harmony with the plant. The selection of mix will be effected by the micro and macro climate you are growing in, the amount of time you wish to spend on caring for your plants, and the pots you are using to grow your plants. Hotter, drier climates need more thermal mass and more moisture retention in the mix. Cooler, wetter climates need less thermal mass and less water retention. In a moist, higher temperature environment (85F° during the day 65F° during the night) one might grow in a mixture of fine and coarse stone, or perhaps with tree fern added to the stone mixture. Some Asian growers in warmer climates use only stone, however we do not recommend this for cooler climates. Stone mixes retain little water and should not be used in growing conditions with low humidity. In a lower temperature environment (65F° during the day 45F° during the night) with medium humidity one might introduce fir bark and sponge rock (coarse Perlite) into the stone and fern mix. A mix of stone, tree fern and fir bark is the most versatile mixture for climates that have colder winters and warmer summers. The bark helps retain some moisture in the mix. In dry climates one might augment the mix with seaweed or moss. This should not be confused with the practice of putting seaweed or moss on the surface of the mix, which is done to slow moisture loss and/or for decoration. Use caution when augmenting the mix with seaweed or moss, In a moist hot climate, at normal watering frequency you would almost certainly get root rot, and leave your plants susceptible to disease, resulting in sickness or death. At Winterview (USA) we use a mixture of stone, bark and coarse Pearlite when growing in plastic pots. In the ceramic vases, we may add some stone or sponge rock (to keep the shipping weight of the plant within reason). This mix used in the ceramic vase is good for most climates in the USA, if you have any questions on your particular conditions please e-mail us the conditions and we can advise an alternative mix. 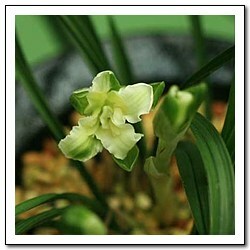 The main method of reproduction of Asian Cymbidium species is by plant division. Plants in deep wide pots will produce many new growths or "bulbs", that can later be divided from the main plant. Even if you are not dividing the plant, it should be repotted evey two to three years to change the mix, and give the plant more room to produce new growths. Keep in mind that crowded conditions do produce more spikes. Carefully remove the plant and remove all of the old potting media from the roots. Inspect the roots; they will give you a lot of clues as to the correct watering frequency, potting media, and general health of the plant. If you wish to divide the plant maintain 2-3 bulbs per division. Treat any exposed cuts with elemental sulfur to reduce risk of contacting virus. Put a cone of new potting media into the bottom of the vase. Spread the roots around the cone. Place the plant so that the oldest growth is closest to the rim of the vase, and the newest growth has room to spread into the vase. Add small quantities of new potting mix, tapping the side of the container to "seat" the mix around the roots. The rhizome should be 1/2 inch to 1 inch below the surface of the medium. Keep the humidity high, but cut back on the watering frequency until the plant has the opportunity to adjust to the new environment (2-3 weeks). At Winterview we use a slightly coarser mix in the bottom of the vase and a finer mix in the top of the vase to better control moisture. Rule of Thumb: When you buy a plant inspect the roots. Healthy plants should have multiple roots. The roots should be white and strong. The total length of all of the roots added together should be more than 18 inches if you are growing in the house, more than 12 inches if growing in a greenhouse. If you can't inspect the roots give the plant a gentle tug. A plant with healthy roots will feel solid in the vase. Once you have unpacked your plant, put it in a moist area that receives filtered sunlight during most of the day. Maintain a regular watering schedule and look at the plant during its watering schedule to see if it responding to the new environment. Do the leaves remain upright? Are the leaves dark green and slightly glossy? It may take three or four weeks for you new plant to adapt to its environment. Use the tips pages below to optimize the conditions for your plant. During the summer growth season we recommend 2 times per week, watering from the rim and allowing the water to run through the pot for ten seconds. Fertilizer can be applied after watering using a sprayer. Summer humidity is best kept at around 75%, but keep air circulation high and on 24 hours a day. During the winter the watering frequency can be 7-10 days. The plants need a rest period! Keep the humidity between 40-60%, and keep some air circulation. In northern climates, shade about 60%-70% during the summer months. In southern climates the shade can be increased. During the winter, shade should be decreased, and in northern climates can be decreased to 20%. Leaves that are receiving the optimal light should be a deep shiny green and curve gracefully. A yellow green color may indicate too much light. Leaves folding and drooping may indicate low light. Temperature differential is the most important factor for blooming. A twenty-degree differential between night and day is optimal. Cymbidium kanran, Cymbidium gorengi require nighttime temperatures near 40~50F° to initiate spike. Cymbidium ensifolium will spike as long as there is a differential. Cymbidium sinense prefers nighttime temperatures of 50~60F° to initiate spike. In climates where summer temperatures are high air circulation should be increased. 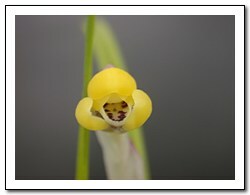 A balanced orchid fertilizer should be applied three weeks out of four. From time to time the pots can be dipped into water not containing fertilizer to wash out any accumulated salts. Stop fertilizing during the winter rest period. The spring is a good time to repot your Asian Cymbidium and inspect the roots. Carefully tap the vase while holding it horizontally to loosen the media. If the plant is severely root bound you may have to break the vase, but usually patient tapping and rolling loosens the media enough to extract the plant from the vase. Properly watered and maintained plants will have a full root structure. Irregularly watered, under-watered or over-watered plants will have a stunted root growth. To view a picture of the specific symptom, click on the name in the left column. Roots too warm Increase thermal mass in mix. Use ceramic vase. Infrequent watering Inspect roots, if dry increase watering frequency. Irregular watering Inspect roots, look for irregular width. If present either increase watering frequency or add mix with better water retention. Insufficient water Ensure that water flows from pot for at least ten seconds during watering. Insufficient watering Inspect roots, if short and dry increase watering frequency. Severe root rot due to over watering Inspect roots, trim rotted roots, treat with sulfur, repot with drier mix. Humidity too low Increase humidity minimum 50% in winter, 75% in summer. Not enough light This is more typical in the Cymbidium ensifolium. Move to an area that gets more light. Decrease density of shade cloth. Check fertilizer strength and frequency, increase slightly during spring growth stage. Insufficient length of light period If plant sits in an area that does not receive sun part of the day move it to a location that receives sun evenly throughout the day. Plant does not flower Pot too large There should be no more than 1 1/2"-2" from the plant to the rim of the pot (unless using Asian vases). Pot too shallow Pot depth should be two to three times the diameter. (Asian vases are sized perfectly). Infrequent fertilizing Correct fertilizing frequency and strength. Plant overheated during growth season Plants that are exposed to high heat >85F° must be shaded and have increased air circulation in order to bloom. Temperature differential not sufficient See culture notes. High humidity Keep humidity below 80% for summer flowering plants, increase air circulation. Insufficient air circulation Air should be constantly moving while not blowing on plant. Drafts Cold drafts from windows etc. Move plant to less drafty location. High fertilizer strength Fertilizer strength should be checked particularly during the blooming stage. Humidity too high Check humidity. Flowers getting wet during misting or watering Ensure flowers do not get watered or misted. Insect damage Inspect for insects. Too frequent watering Reduce watering frequency. Infrequent watering Water more frequently the roots are drying out between waterings. Irregular watering Water in a regular pattern. Mix water retention not high enough for climate Augment mix with higher water retentive media.